In theory, most undergraduates at Harvard have a stake in UC funding policies. To finance student events, the College requests undergraduates pay a $75 UC Activities fee each academic year. Here is where their money goes. Last February, the Undergraduate Council published all of its Finance Committee’s grant allocations dating back to the fall of 2011 in an effort to improve communication between the body and undergraduates. 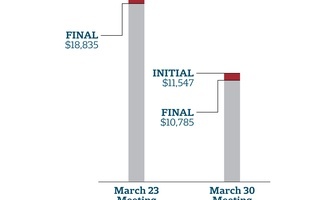 The public data includes information about which student organizations requested funding, how much they requested, and how much the Finance Committee chose to allocate. This semester in particular, the UC has come under the microscope for its funding policies and ability to regulate attendance at events that receive grant money. The majority of the UC’s budget, financed by the activities fee, goes towards the General Grants Allocation, a fund the Finance Committee then distributes to student organizations. The UC also provides $6,000 per semester to each of 12 House Committees, and uses $21,500 in funds on the Council’s committees—which goes towards initiatives including publicity, Datamatch, and food for student events. Calculated based on proportions of UC budget. Food, club sports, and travel account for the majority of the funding from the UC Finance Committee so far this semester. Student organizations may receive $2 to $4 per person for food and $4.50 per person for travel, while club sports may receive a maximum of $2,000 in total funding each semester. Because the committee has gone over budget in recent weeks, it has cut weekly funding in amounts ranging from 6.6 percent to 29.5 percent. The Harvard-Radcliffe Dramatic Club has received more money from the UC than any other student organization in the past five years, prompting the Finance Committee to pass a controversial policy capping funding to theater organizations earlier this semester. 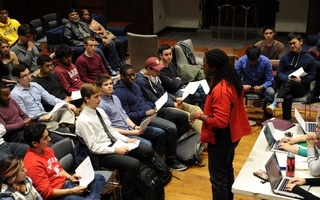 In fact, during three of the past four academic years, the Harvard-Radcliffe Dramatic Club received the most funding of all campus student groups. The Chinese Students Association has been in the top 5 grant-receiving clubs for the past four years, while the South Asian Association has been in the top 5 for the three of the past four years. The top 20 percent of grant-receiving organizations are required to have members undergo sexual assault prevention training, according to a new policy the committee passed this semester. 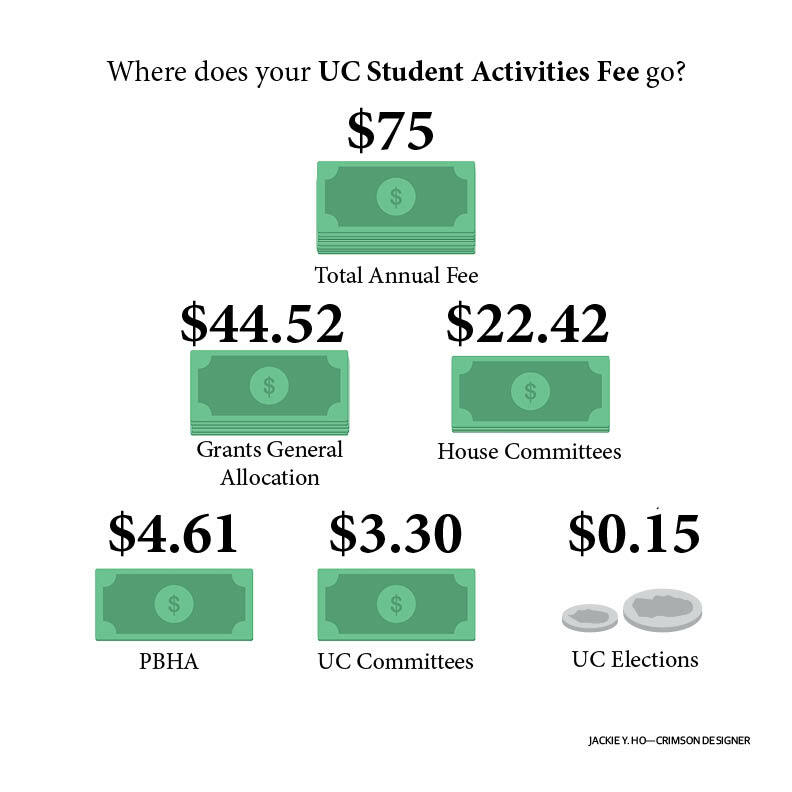 During the 2014-2015 academic year, student organizations requested less funding from the UC than any other year on record. 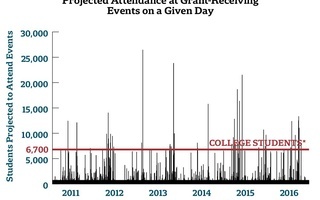 Over the course of the year, student organizations requested $470,599, a decline of more than 25 percent compared to the year before. The total budget distribution is based on the UC’s “Continuing Resolution Concerning the FY16 UC Budget” passed on Sept. 20, 2015. The data on top clubs funded, total money requests, and grant allocations is taken from the “Undergraduate Council Master Grants Spreadsheet,” made available by the UC in February. The distribution of UC grants was also taken from the master grants spreadsheet for the first eight weeks of the Spring 2016, with the following modifications: some of the values labeled “Other” were re-categorized based on the labels provided on the spreadsheet, and theater and performance group funding was separated into its own category. Note that the distribution of UC grants money is approximate—depending on how various expenses are classified, numbers may vary. The Undergraduate Council’s Finance Committee recently chose to cap funding for annual student performances at $1,000 this semester in an attempt to push student groups hosting the events to search for funding sources outside the UC.